Kids Dentistry or Pediatric Dentistry is a branch of dentistry which treats the issues of children and youngsters till they reach adolescence. 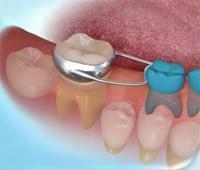 It is not just normal dentistry practiced in any dental clinic in Pune. According to the pediatric dentists in Pune, it is a specialization that involves assisting the soft and tender infants in maintaining good oral health and explaining their parents, its importance. What's on offer at Sparkle? Topical fluoride applications are especially beneficial for children who are growing up in an area without fluoridated drinking water or without the proper means for good oral care and hygiene. But even for children with access to fluoridated water and oral care, a topical application can still be helpful. A topical fluoride treatment isn’t a stand-alone application, but a regular part of your child’s dental care of daily brushing and flossing and semi-annual dental cleanings and checkups. Topical fluoride enhances the care they already receive to help produce stronger enamel for future healthy teeth. 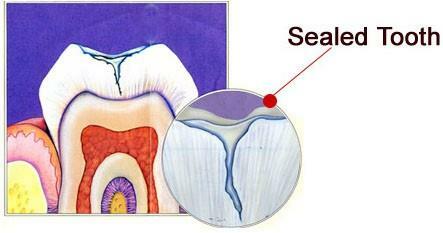 Sealants are a protective coating put on the grooves of the teeth to help prevent cavities. The grooves on the top of the molars are harder to get clean, and sealants help prevent bacteria building up in the grooves causing decay and the need for a filling. Fillings are used to save a tooth that has been impacted by a small amount of decay. When a tooth is impacted by decay, the dentist uses his or her drill to remove the bacteria and builds the tooth back up with filling material. A crown is used to save the natural tooth after it has been impacted by a large amount of decay. A crown, or commonly called a cap, sits on top of the base of the natural tooth and serves as the chewing surface of the tooth. A crown is used to restore in the hopes of not having to pull the tooth. Both white crowns and metal (stainless steel) crowns are available. 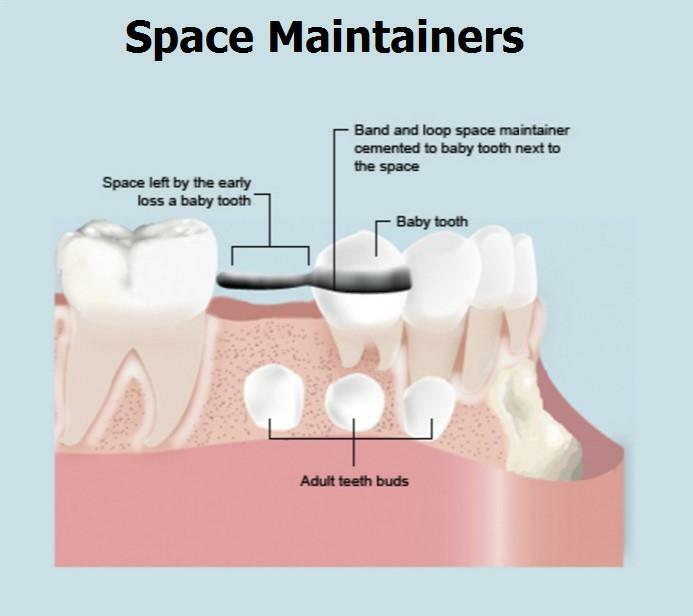 Space maintainers are placed in the mouth to hold a place for the permanent teeth below the gum to come in properly and to prevent crowding. It is important to prevent crowding because crowded teeth are harder to clean and care for, which can lead to the need for extensive dental work. Visit Sparkle, the best dental clinic in Pune, for the oral health of your kids. Why Sparkle is the Best Dental Clinic in Pune ? Sparkle Dental Clinic, in association with pediatric dentist in Pune, Dr. Sneha Patil, is set up in such a manner so as to make kids feel at ease about visiting their dentist. We believe that by helping children feel comfortable at the dentist at an early age, we can help alleviate fear of the dentist and dental work. Our pediatric dentists in Pune believe that this is vital to establishing a lifetime of healthy dental habits. At Sparkle dental clinic, our pediatric dentist in Pune also welcomes and treats children with special needs. Dental care is important for everyone, and we will make any accommodations that we can to ensure a child with special needs has a positive experience at the dentist. Sedation options are available for children that have trouble controlling their movements, the friendly environment of the office is engaging, and our private operator rooms allow for a soothing private experience for children that feel overwhelmed. So, schedule an appointment and visit our Dental clinic in Pune with your kid, for all tooth related problems. How often to visit for a dental checkup? The American Academy of Pediatric Dentistry recommends a dental check up and cleaning every six months for most children. Some children need more frequent dental visits because of increased risk of tooth decay, unusual growth patterns or poor oral hygiene. Our child/pediatric dentist in Pune, Dr. Sneha Patil will let you know the best appointment schedule for your child. Taking care and pride in oral care is something that should start at a young age in an effort to create good habits that last a lifetime. After the teeth have been erupted, it is important to begin brushing and flossing the teeth. Children do not have the dexterity to brush their teeth effectively until about age 7. Until then, it is important as a parent to help them brush their teeth twice a day, for two minutes. Angle the toothbrush towards the gum line and brush in small circular rotations along each surface of the tooth. As your child’s fine motor skills begin to develop, it is natural for them to want to try and brush their teeth on their own. It is important to continue helping them brush to ensure all surface areas have been covered, and then offer to let them try! This is what our pediatric dentists in Pune recommend to kids and their parents. What about the check ups and cleanings? Checkups and cleanings should start with when the child’s first tooth comes in and continue regularly every 6 months, unless directed otherwise by your dentist. At each checkup, we will go through what to expect at the visit. Sometimes, X-rays will be necessary and at other times, they may not be. So, in case you visit our clinic, an examination by our pediatric dentist in Pune is required at each checkup, to ensure healthy and proper oral growth and development. So, visit our dental clinic in Pune, for the ultimate care of your child's teeth. Space maintainers are placed in the mouth to hold a place for the permanent teeth below the gum to come in properly and to prevent crowding. It is important to prevent crowding, because crowded teeth are harder to clean and care for, which can lead to the need for extensive dental work. At Sparkle, our child dentist in Pune welcomes children with special needs. Dental care is important for everyone, and we will make any accommodations that we can to ensure a child with special needs has a positive experience at the dentist. Sedation options are available for children that have trouble controlling their movements; the friendly environment of the office is engaging, and our private operatory rooms allow for a soothing private experience for children that feel overwhelmed. The steps in the home teeth whitening regimen are fairly straightforward. The cosmetic dentist's office provides the patient with the materials and instructions and also answers questions the patient may have about the routine. Your dentist's office can also provide you with off-site supervision should you have any questions once you've begun. A home whitening session can last for two to three hours, during which time you will have the tray and solution in your mouth. Depending upon your needs and desired results, your dentist may instruct you to keep the tray in your mouth overnight. Typically, you will follow your home teeth whitening regimen for two to three weeks, after which time you will return to your cosmetic dentist for a follow up visit. Generally speaking, the price of teeth whitening increases with the number of in-office treatments required by the patient. Dental insurance does not typically cover the cost of the teeth whitening procedure. Using a specail light with a whitening gel, this is an in-office bleaching system. It is often followed up with an at-home bleaching kit if needed. Advantage: One visit is usually all it takes for a bright smile. The tooth whitening treatment typically costs 7000/-. Using a laser with a whitening gel, this is an in-office bleaching system. The translucent bleaching gel is applied to the teeth and a laser light is used to activate the crystals to absorb the energy from the light and penetrate the teeth enamel to increase the lightening effect on the teeth. The length of time in the cosmetic dentist's chair depends on the degree of discoloration you have. 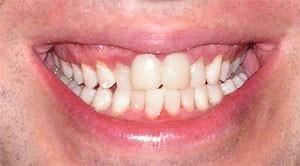 A custom fitted tray is worn over your teeth. A small amount of the bleaching gel is placed in the tray and worn for a brief amount of time each day. This is a common technique because it's easy to use and costs less. Impressions are taken of your mouth and a thin custom made plastic tray is made which you take home and wear for about one to two hours per day. While some results may be seen in a couple days, it usually takes one to two weeks to see the full whitening of your teeth. This procedure is sometimes used in conjunction with the in-office laser bleaching if you have severe discoloration (dark grey or purple) or internal teeth staining. Advantage: A gradual whitening of your teeth over time will be less noticeable to others that you're undergoing this procedure. The cost is relatively low. Today we have exciting new biomaterials that can give your smile a lift without invasive treatments. 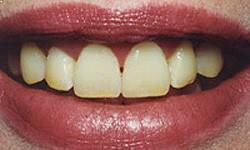 Ultra-thin porcelain veneers or composite veneers can correct chipped, weakened, or discolored teeth. No more yellow or stained teeth; no more gaps or embarrassing chips. And veneers can return real structural integrity to damaged teeth, while leaving them looking as good (or possibly better) than the originals. 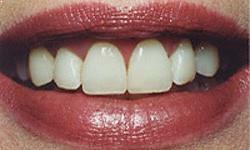 Composite are glass filled resins that are bonded to the teeth. The materials have improved dramatically in the past twenty years in terms of durability, esthetics, wear and use. They are used to repair fractured teeth, close small gaps between teeth, lighten teeth and to enhance the smile. "Ceramic Veneers (Indirect veneers) Ceramic veneers, alternatively termed dental veneers or dental ceramic laminates, are wafer-thin shells of porcelain that are bonded onto the front side of teeth so to create a cosmetic improvement for a tooth, ceramic Veneers retain their beautiful luster and vitality, as they are much stronger and more durable than plastic composite bonding. Sometimes composites will stain or shrink with age, but veneers will not. The best part is that there are no age group limitations. Everyone can benefit, young and old alike. Fractured teeth with a fair amount of tooth structure left. 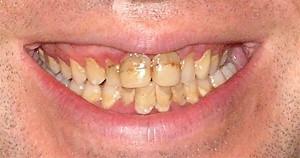 Teeth with multiple fillings which have compromised the aesthetics of the smile. Your Dentist will first analyze your smile to determine which teeth require veneers. Depending on how much tooth shaping is required, you may or may not require anesthesia. Ceramic veneer technique is an offshoot of the basic science of cosmetic dental bonding. we have had materials available to us for decades that are capable of creating a tenacious bond with tooth enamel, ceramic veneer technique utilizes the bonding capability of these materials to securely attach a thin shell of porcelain (the porcelain veneer) to a tooth, Although porcelain is inherently brittle, however when it is firmly bonded to a sturdy substructure (a tooth) it becomes very strong and durable. The biggest advantage of a veneer is that too little tooth material is removed and hence won't weaken the tooth structure. It is also rightly called as "CLONED ENAMEL". They look and feel completely natural. A beautiful result is achieved in just a few days time, and can last for many years. The texture and finish of porcelain veneers make them highly resistant to external staining. Due to their durability, looks and comfort, veneers have become one of the most popular cosmetic dental treatments available today. Veneers today are widely used by people in the entertainment field and show business to obtain a beautiful smile. Regular check ups will ensure your veneers are in excellent shape. Well maintained veneers should last you for many years and give you a long lasting and beautiful smile. If a porcelain crown or bonding does get looking lackluster or starts staining, there are polishing techniques that can bring the luster back. When you have porcelain veneers, we recommends extra maintenance polishing appointments - two extra appointments per year - to keep the shine at its maximum, especially at the critical bond area between the tooth and the veneer. The biggest "no-no" is heavy, frequent alcohol consumption. If you consume large quantities of alcohol daily, the alcohol tends to dissolve bonding or the composite luting material that holds the porcelain to the tooth. Within a period of a couple of years, you could completely ruin the dental work. So, watch your alcohol consumption. Moderate amounts won't have a noticeable effect. Beware, also, of alcohol-containing mouthwashes. Read the list of ingredients on any mouthwash. Don't subject your teeth to sharp impacts or hard objects. Don't bite pins, nails, or staples. Don't grind your teeth. If you tend to grind at night, get a night guard to protect your teeth. If you engage in contact sports, wear an appropriate athletic mouth guard. Floss and brush your teeth carefully. While the porcelain or bonding work is immune to decay, the part of your teeth not covered by the cosmetic work is still susceptible to tooth decay. You can still get cavities with veneers or bonding or crowns. Keep it clean and it will stay decay-free and protect your investment. Watch snacking! This is very important. Between-meal snacking is the single biggest factor in promoting decay. Many dental professionals don't even understand this, but this has been solidly established by scientific studies. If you are a constant snacker, you feed your plaque bacteria all day long, regardless of your excellent brushing habits. The best thing you can do to prevent decay, the deterioration of your teeth and the dental work, is to limit your eating to your basic three meals a day and maybe a couple of snacks. 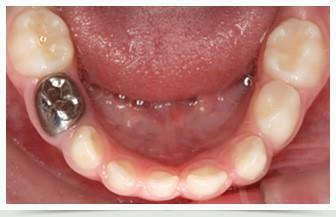 Metal free ceramic crowns are distinguished by thieir excellent aesthetics. Light, is not only reflected, there is also real transparency as seen in natural teeth. This effect makes the metal free ceramic crown perfect for use in anterior areas, where by minor form and alignment corrections are also possible. A further advantage of metal free ceramic crown is the tooth shaded margin, which need not To be placed under the gum line. Thus, the crown margin does not irritate the gingival tissue And prevents gum recession. It is an extremely biocompatible material with no allergic potential. This can be a real Advantage to predisposed(allergic) patients. With smaller defects, limited to the outer surface, we prefer treatment using porcelain facings (veneers) allowing more of natural tooth to be preserved during preparation. Zirconia crowns, if they are done right, can be translucent enough to look natural. And if they are bonded to the teeth, instead of being cemented with conventional dental cement, they won't show a black line at the gumline. Gum surgery involves the grafting of gum tissue to a part of the mouth where gums are receding, due to periodontal disease, aging, or natural wear of gum tissue. Gum Contouring involves the removal of excess gum tissue, either manually or more commonly with a laser, to improve a "gummy" smile. Gum contouring may be required to correct a "gummy" smile. A gummy smile is indicated as teeth that appear to be too short and/or gums that appear to be too prominent. This can occur by either an excess of gum tissue over the teeth (Excessive Gingival Display), or by excessive grinding of the teeth, causing the teeth to become shorter and making the gum tissue appear more prominent. We can add composite fillings to lengthen your teeth to look better or trim teeth. The more skilful the dentist the better the results. The color, size, and shape of your teeth all have a profound impact on your appearance. While it is often the desire of people to improve the look of their smiles, it is the goal of aesthetic dentistry, to do this while still maintaining a "natural" appearance of the teeth. This often requires addressing one or all of the above-mentioned criteria. How is it that alterations in these three characteristics enhance your smile? Tooth color is most commonly what people see first. As you get older, your teeth get darker. The reasons for this include normal changes that occur within the tooth and repeated insults from environmental conditions (coffee or tea stains, for example). Generally, then, darker teeth are associated with older age. The easiest way that aesthetic dentistry can correct this is by teeth bleaching. But this alone may not entirely create a natural-looking appearance. Size and shape also are major factors that define the appearance of teeth. The most common cause of changing tooth size and shape over time is tooth wear; and the most common cause of wear is tooth-to-tooth contact, or grinding. Wear on the edges of the teeth can give the appearance of aging because you do not show as much of your teeth when you smile. Another factor that affects how much of your teeth show when you smile is the loss of skin tone as you age. This loss of tone causes your face to sag, thereby showing less of your upper teeth and more of your lower teeth. The aesthetic dentistry treatment to enable more teeth to show when you smile will depend on the cause. If the cause is due to wear of the teeth, dental veneers or dental crowns can be used to regain the lost length and fill out the smile. On the other hand, this may not have a significant effect if the cause is due to the loss of skin tone associated with age. If this is the case, plastic surgery may be indicated as part of the treatment. 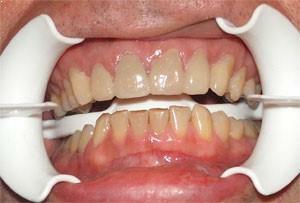 Case I : Extreme Makover: Tetracycline Staining changed with Veneers ! Patient had been seen in March 2006 at which time I advised that Britesmile would not change the colour of a tetracycline stained tooth. Veneers were the only option. Patient can remember having yellow bands on the teeth as far back as childhood . Treatment planning was done months in advance using mainly photographs as our guide. Here are the results as completed in November 2006 over a period of 10 days ! In total 16 veneers were done. 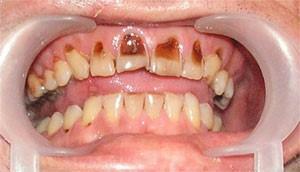 Patient reported to the surgery with extremely poor hygiene having not seen a dentist for years. Needless to say he was thrilled with his result ! Patient reported to the surgery with badly worn out teeth due to excessive tooth brushing . Procedure involved doing Porcelain veneers and Composite fillings.